It begins. On September 18th the Board of Supervisors directed the county administrator to prepare the proposed FY2017 budget at two options: the current real property tax rate ($1.135) and the estimated equalized real property tax rate ($1.115). 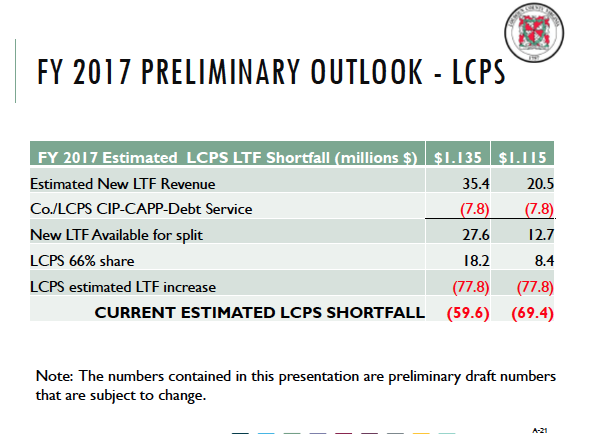 With the current LCPS estimate for its budget, there is a projected gap of $59.6 million at the current tax rate or $69.4 million at the lowered tax rate. The final decisions on the LCPS budget and local funding will be made by the newly elected School Board and Board of Supervisors in the coming year.